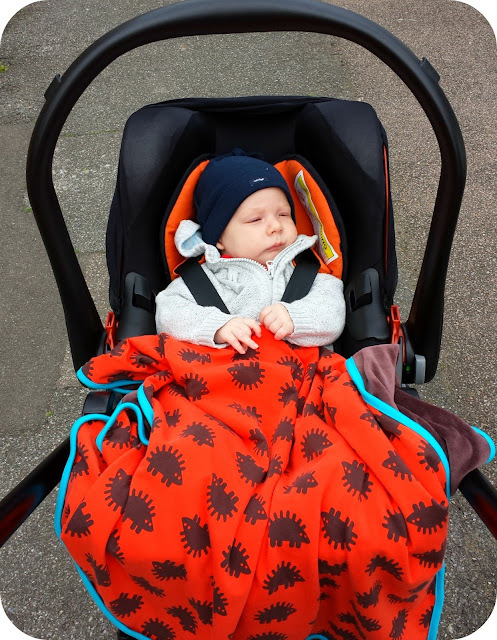 One of my favourite brands in the baby world have recently released a new product and they invited Archie and I to try it out. Kiddy's new Evolution Pro infant car seat really is one of a kind and we have fallen head over heels for it. 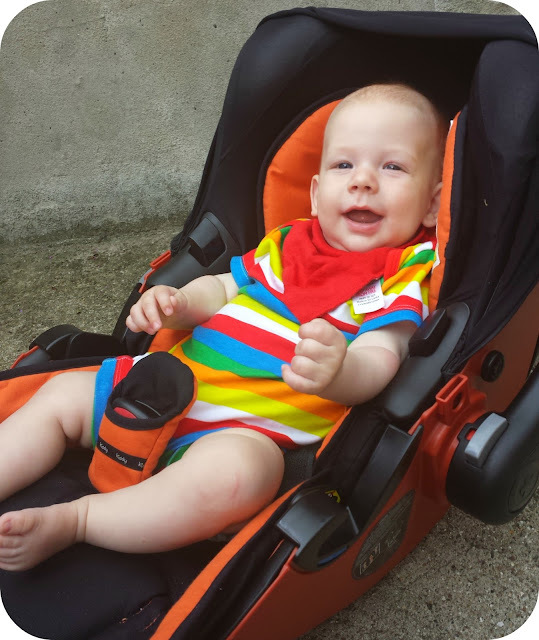 Unlike other baby car seats, this comes in a large choice of colours and even the outer shell can be brightly coloured. We went for Jaffa, the bright orange version as I love the shade and it would be perfect for a little boy or girl. a removable newborn insert which Archie was already too big for when we got it so I think the evolution would be perfect for a premature baby. Without the insert Archie is comfortable and secure but still has plenty of growing space. The huge selling point of this car seat for me though is its lie flat function. 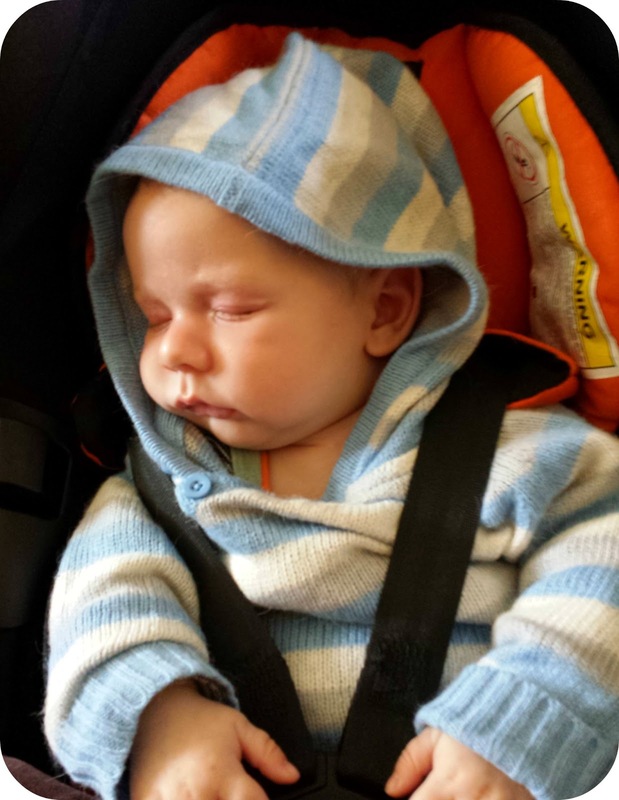 Whilst in the car, the seat is in the usual infant car seat position which offers the best protection for them should the car be in an incident, however when the car seat is transferred to a travel system (it is compatible with the click'n'move), the handle can be moved to the back of the seat, which pushes baby's bum up until it is in almost flat position. It is not recommended that a baby stay in a car seat for more than an hour as it places undue stress on their neck and spine but with the flat function, this car seat can be used for much longer. This is perfect for busy days when you need to quickly pop out for something as you don't need to wake the baby to put them in a carrycot or pushchair. The car seat fits easily on the chassis with very simple adapters. One downside I did find was that the conversion from sitting up to lie flat can be quite noisy and despite Archie being a second child, he is quite a light sleeper. The bottom of the seat is curved however and perfect for rocking, so should the movement stir a sleeping baba, you can gently rock them back to sleep. You also cannot have the hood up when the seat is in flat position which is a bit of a shame but you can buy a parasol that clips straight into the seat which would be perfect at keeping little eyes in the shade. I loved the integrated section to store the manual as I am terrible at losing things like this generally. There is a small flap at the front that the book can sit in. The seat is easy to fit into a car using a 3 point belt and the back section clips down revealing the hook for the belt to be taken through. The panel helps keep the seat looking smooth and also means that in the reclined position, the hook has disappeared so you cannot fit the seat incorrectly. The car seat feels sturdy, strong and safe and the design is gorgeous, perfect for parents who are fed up of black (although there is a black option still). The carrier is suitable up to 15 months and suitable for premature babies too making it a perfect first option. 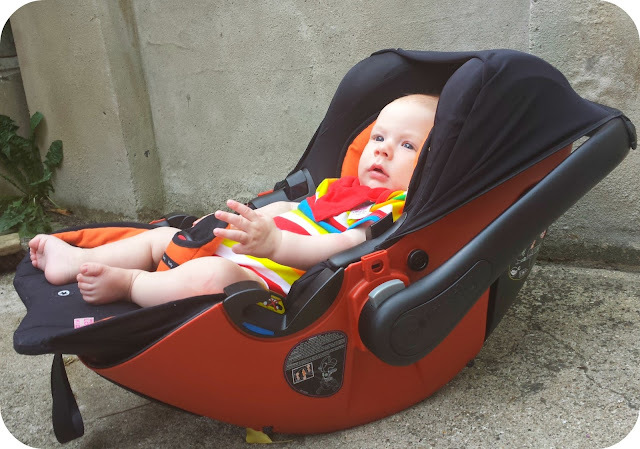 The 3 point harness features padded straps and you can buy an additional parasol that slots in to the seat too. Overall I can highly recommend this seat. I trust it to keep my son safe and he seems comfortable and happy in there. 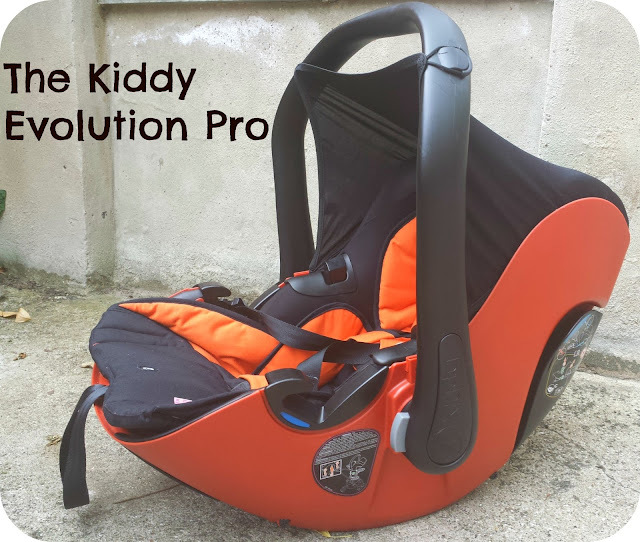 Disclaimer: We were sent a Kiddy Evolition Pro for the purpose of this review but all thoughts and opinions are completely my own.